A good poem demands multiple reads to admire its structure and meaning. A great poem demands transcription to learn how to write it. You do not photocopy the poem, but rather transcribe it, to pin it to the wall and share with your peers. 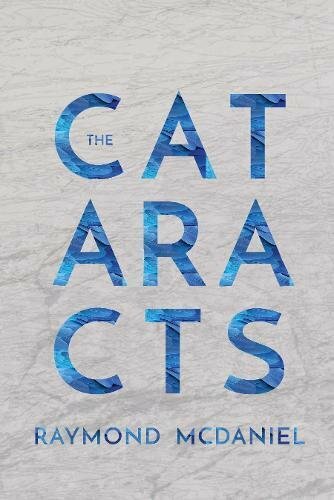 The Cataracts by Raymond McDaniel is a collection of great poems. Staying true to the title, each poem combines philosophy and poetic tools to deconstruct landscapes into multiple images, and then rearranges those images into something entirely new, as if engaging metaphysics to create revelations. The poem continues to describe a beach rife with shark teeth and what happens when the poet discovers a “translucent man” buried and lost years before. From afar, the man appears like an ordinary, unscathed object; but up close, the man is “broken.” It is here the reader has a revelation: life is everything but simple; it must be inspected, studied, and adored, adored like a fascinating collection of shark teeth. Here the poet presents a list of “optical illusions” that appear only when seen through impaired vision. The poet suggests that distorted images can be just as powerful and spiritually fulfilling as those seen with perfect sight, in fact more so. The poem challenges the reader to visually fragment objects, deconstruct them, and then reassemble them into something entirely new, thus creating new human sentiment. Some poems in this collection require additional research for a casual reader, for those who wish to appreciate the poems for what they are instead of what they are required to know. For example, “Kwaidan” is a poem about a Japanese folktale about Hoichi the Earless. Even though the second stanza reads “This is the lesson of Hoichi / the Earless”, the reader still needs to know the cultural context and research the backstory to fully appreciate the poem. Another instance of this occurs in the very next poem, “Claire Lenoir,” in which the poet actually provides the background for the character in the first seven lines. Art should be loved for what it is, without needing to know everything about its origin, to be able to simply see it and enjoy its elegance. Art should be accessible. Poems are art. Thus, in select poems, some readers should be prepared for some historical and cultural research to enjoy their context, their art. The craft of the writing is also an art. The collection incorporates several different free verse poems, all of which have varying line and stanza breaks. Some poems are narratives, while others flow vertically down the page. One poem, “There is but one truly serious philosophical problem,” is four lines, with a grand total of eight words. The diversity of poems demonstrates poetic skill and range. Thus the varying techniques engage the reader visually. The casual reader might get lost in some poems because their stanzas carry merely a few words, while others are multiple lines and very long, thus the poems risk confusion. The will reader will also be asked philosophical questions, which they might not know the answer to, thus risking misinterpretation. That being said, all readers should definitely accept these challenges. McDaniel’s poetic skill and subject knowledge is clear. All poems fortify the title, and they are arranged perfectly. This is an exciting collection, which I encourage everyone to enjoy, to experience all views of life through inspired reflections.